House Speaker Paul Ryan announced late Tuesday that he has scheduled votes on two amnesty bills for next week. The votes will kill off the amnesty-discharge pushed by a breakaway group of pro-business Republicans, but it could allow a coalition of business-first Republicans and pro-migration Democrats to rush through a cheap-labor amnesty for business donors and for millions of illegals before the public can shout its opposition. 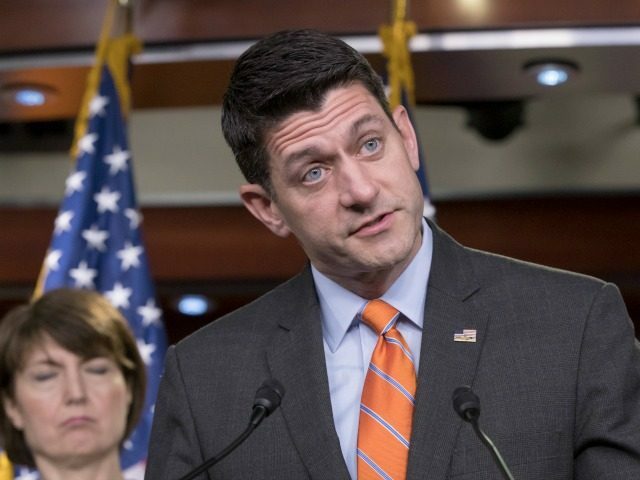 “Members across the Republican Conference have negotiated directly and in good faith with each other for several weeks, and as a result, the House will consider two bills next week that will avert the discharge petition and resolve the border security and immigration issues,” said the statement from Ryan’s office, which did not mention President’s Donald Trump’s push to build a wall and to end the visa-lottery and chain-migration programs. One of the bills will be the immigration measure developed by the chairmen of the House judiciary and homeland defense committees, Rep. Bob Goodlatte and Rep. Michael McCaul. Their compromise bill is expected to fail, partly because some GOP legislators oppose any form of amnesty, some GOP legislators oppose any reductions in legal immigration, but mostly because the GOP leadership will not whip support for the Goodlatte-McCaul bill. The other bill will be drafted by Ryan’s team. But Ryan’s central role raises fears that it will be a giveaway to GOP donors who are threatening to close their checkbooks unless the Party provides them with even more cheap labor than what is already delivered by the government’s offer of green cards to 1 million legal immigrants each year and by the many work-permit programs. Those programs include the H-1B, H-2B, H-2A, L-1a, L-1b, OPT, TN, (c)(8), and DACA programs, and they keep a population of at least 2 million foreigners in U.S. jobs. Ryan has long favored high levels of immigration to help businesses import new employees, and has opposed President Donald Trump’s lower-immigration/higher-wages policy. In a 2013 presentation with amnesty advocate Rep. Luis Gutierrez, for example, Ryan said he favored an “open door” immigration policy. The Ryan announcement came just after the failure by the breakaway group of legislators to get the needed 25 signature for their amnesty discharge. If the group had won 25 signatures by the end of June 11, they would have allied with Democrats to pass a no-strings amnesty on June 25. GOP leaders, including Majority Leader Ken McCarthy, kept the number of signatures below 25 by offering GOP legislators the chance to vote for an alternative bill that would give business groups the extra labor they are demanding. I also commend the Speaker and the Majority Leader for committing to me personally to bring forward a separate immigration bill that addresses agriculture’s labor needs before the August district work period. The “separate immigration bill” may be the unreleased Ryan bill, or it may be a guest-worker program attached to the pending agriculture bill. Newhouse’s statement makes no mention of Trump’s priorities, including a border wall, reforms of asylum law, ending the visa lottery and ending chain-migration for extended families. The Ryan announcement also came after the House Freedom Coalition declined an amnesty bill drafted by the amnesty-discharge group. That bill offered a huge amnesty but none of the cutbacks in legal immigration that are part of President Trump’s ‘four pillars’ immigration reform. A June 12 report by Politico said the group was even demanding more imported labor for the construction industry. Moderates appear to be considering tougher asylum standards but say E-Verify is problematic. While some moderates back the employment verification system, they say it must be accompanied by a guest worker program allowing immigrants to work on farms and in construction, for example, jobs many Americans won’t take. “While the legislation to be revealed in the coming days is based on the productive negotiations hosted by House Leaders over the last several weeks, it is vital our colleagues remain committed to the discharge petition. That demand for more imported labor is a central goal of the donors who are funding Curbelo and other GOP politicians on the discharge-amnesty list. “Our goal is to not cut legal immigration,” Curbelo told RollCall.com on June 8. The number of illegals who get green cards from the amnesty should be “as high a number as possible,” he said. The number of young illegal immigrants in the United States is estimated at up to 3.6 million, and 1 million people legally immigrate each year. Also, a large share of the discharge-amnesty group is composed of GOP legislators from agriculture districts — such as Newhouse — where cash-poor farmers and dairy farmers cannot easily replace the legal and illegal workers who leave the farm for better-paying jobs in town. The problem is tougher for farmers near Democratic-controlled cities, such as New York, where officials tout their determination to block the enforcement of immigration laws. Ryan is about to force members to vote for his “consensus” language could deliberately undercut years of Republican promises against granting amnesty and ignore the issues that have wide support among the base—meaningful border security measures, Trump’s wall and an end to extended-family chain migration and the diversity visa program. It’s a pointless exercise with little to gain and a tremendous amount to lose. Members of the House who prioritize strong border security should not compromise their principles and vote for the Ryan effort, especially if it is simply a political exercise designed to avoid the embarrassment of House Democrats taking over the floor of the Republican House. Bovard is the senior director of policy at the Conservative Partnership Institute. Amnesty advocates use business-funded pollsters to conduct “Nation of Immigrants” push-polls which show apparent voter-support for DACA amnesty, for immigration, and immigrants. Those pollsters also push their clients’ preferences when they advise their political clients. But “Choice” polls reveal most voters’ often-ignored strong preference that CEOs should hire Americans at decent wages before hiring migrants. Those pro-American preferences are held by many blue-collar Blacks, Latinos, and by people who hide their opinions from pollsters. Similarly, the 2018 polls show that GOP voters are far more concerned about migration — more properly, the economics of migration — than they are concerned about illegal migration and MS-13, taxes, or the return of Rep. Nancy Pelosi.